Today's Google Doodle (July 22) is for Alexander Calder's 113th birthday. It's not in the archive yet, so if you want to see it today, just go to google.com. It's a scriptable rendering of a Calder-like mobile (I assume it's not an actual Calder since it spells out google) so I'm not sure if there will ever be an image that I can simply paste here. Last edited by sky on Sat Nov 05, 2011 6:10 pm, edited 1 time in total. Today's doodle is for Art Clokey's 90th birthday ... that is if you keep counting after he died. But, in any event, it's a cool interactive doodle with Gumby, Pokey, Prickle, Goo and a couple of Block Heads. Last edited by sky on Sat Nov 05, 2011 6:08 pm, edited 1 time in total. This is a good one - Mies Van der Rohe's 126th birthday! yes - that was a good one. i especially liked the clear glass rooms at either end of the google. As a British-American (but admittedly not much of a royalist) I thought I would add this one one to Sky's collection. 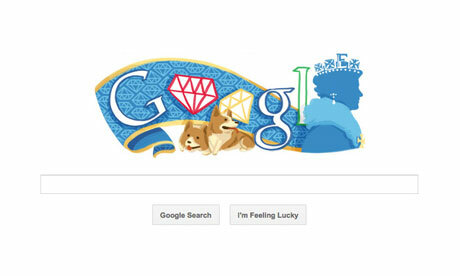 For thise of you unaware, the Queen is a big fan of Corgi dogs. First thought ... sixty years as the Queen ... haven't those folks ever heard about term limits? There's an ad you have to sit through, and it starts off a little un-corgi-like, but give it some time; it will grow on you too. I may never post here again without including at least one corgi reference. A Google Doodle is a special, temporary alteration of the logo on Google's homepages that commemorates holidays, events, achievements, and people. ... By 2014, Google had published over 2,000 regional and international Doodles throughout its homepages, often featuring guest artists, musicians, and personalities.